Gold is on a tear following its disappointing 28% drop in 2013. "Gold rebounded from December into mid-March, adding $200 an ounce, or nearly 17%," Money Morning's Resource Specialist Peter Krauth said. Gold stocks are up as well, and investors are looking for the best gold stocks to buy. 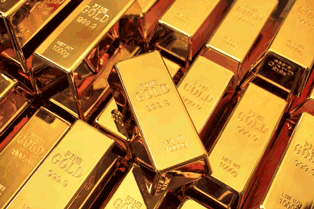 And according to Krauth, that's a good move – he's bullish on gold stocks in 2014. "To a large extent, I think the bears were exhausted, and most (if not all) sellers had finally sold," Krauth said. "So, gold was coming off a technical low and sentiment extreme around the $1,190 price range." Krauth pointed to the U.S. Federal Reserve's quantitative easing program and ultra-low interest rates in the United States, Japan, Europe, and China as contributing factors to gold's recent growth. Additionally, the unstable political news out of Ukraine has pushed gold's value higher. Safe-haven investments like gold and other precious metals become more sought after when geopolitical tensions mount. The first gold stock that Krauth likes is Royal Gold Inc. USA (Nasdaq: RGLD). "ConsiderRoyal Gold Inc., a $3.3 billion royalty company, with interests in more than 200 production, development, and exploration-stage royalties," Krauth said. "Royal Gold boasts $680 million in working capital and $350 million in undrawn credit it can put to work." According to Krauth, royalty companies are extremely profitable right now. Gold miners face numerous issues at the moment, and that has them leaning heavily on royalty companies like RGLD. "In this trying environment for miners struggling with rising production costs and scant financing options, royalty and streaming companies have the upper hand, able to do financing deals with extremely favorable terms (for them)," Krauth said. "They have cash when cash is scarce, and that will pay off big time." RGLD stock has jumped nearly 46% year to date and 7% in the month of April.